Side chasses are to Cha Cha, like Eggs to an Omelette. You can’t make them good without the right raw ingredients! 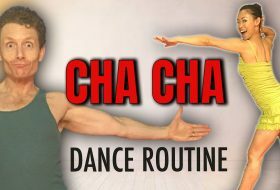 This basic Cha Cha Side Chasse step is one of 7 Chasses that are used in International Cha Cha Dance. So, get familiar with it, especially if you are a beginner dancer. 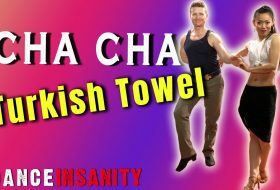 Abandon those mistakes/bad habits TODAY by using the 5 corrections below to make sure you are practicing your Cha Cha side chasse dance technique the correct way! You can do it! 2. Close the ankles on the 2nd Step and keep your feet pointing outwards. 3. Work your inner thighs forward on the last step (especially on the free leg). 1. Hips rotate in opposition to the leg you are moving. i.e. : Moving the right leg side, left hip rotates back and vice versa. No Bouncing. I repeat. No Bouncing. 1. Straighten the leg before you put your weight on it. 2. Keep the standing leg straight when you push off. Often, dancers will bend the leg they are standing on to create more push off, which will erroneously create a bounce action. 1. Bend your knee when you move your leg. 2. Straighten your knee when you are about to transfer weight onto it. 1. Keep your Torso directly parallel to direction of chasse. 2. Do not turn your body before finishing the entire side chasse. This mistake is especially prominent in side chasses going into New Yorkers or Hand-to-Hand etc. If you have accumulated bad dance habits, you just need time and deliberate practice to start acquiring good new habits. It takes time, but it is also possible, as long as you pay attention to the right ways to perform your dance technique. If you have trouble with that, this article Making New Habits Stick can help. Let me know what you are working on improving in the comments below.